Steve Carlson, his brother Jeff, and Dave Hanson were all professional hockey players when they were drafted to play the brawling, goonlike Hanson Brothers in the 1977 movie Slap Shot. Slap Shot was a hit, but it was an irritant for the young men during their sports careers. "All anyone wanted to talk about was the movie," Steve says. "Nobody was asking me about the game, the way I was playing, what I did, or why I did it. 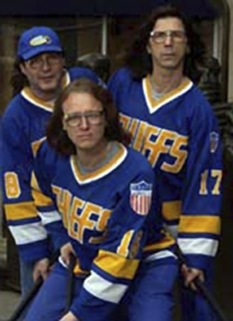 All anyone wanted to know about were the Hanson Brothers. It did get a little sickening. Remember, I was a hockey player, not an actor." What's more, because of the characters' two-fisted style, Steve, Jeff, and Dave often were forced to defend their reputations on the ice. Steve played for ten teams during a 14-year career, including one season in the NHL with the Los Angeles Kings. He later became a minor-league coach. Dave's playing career featured ice time in nearly every league. He later became general manager of the AHL's Capitol District Islanders and manager of the Pittsburgh Penguins' practice facility. Jeff's career was shorter. After retiring from the sport, he became an electrician. But the trio learned to embrace the movie when they reunited in 1993 and took their hockey shtick on the road. Now in their 40s, Steve, Jeff, and Dave perform as the Hanson Brothers at charity events and NHL and minor-league games, about 80 to 90 events a year. DISCLAIMER: PFP Sports Talent Agency does not claim to represent itself as the exclusive agent for Hanson Brothers . PFP Sports Talent Agency is a booking agency that represents organizations seeking to hire pro athletes and sports personalities such as Hanson Brothers for speaking engagements, personal appearances, product endorsements and corporate entertainment. Fees on this website are estimates and are intended only as a guideline. Exact fees are determined by a number of factors, including the location of event, the talent’s schedule, requested duties and supply and demand. PFP Sports Talent Agency makes no guarantees to the accuracy of information found on this website and does not warrant that any information or representations contained on this website will be accurate or free from errors. We are often asked how can I find out who is Hanson Brothers 's agent? To find Hanson Brothers appearance fees and booking agent details, you can contact the agent, representative or manager through PFP Sports Talent Agency for speaking fee costs and availability. PFP Sports Talent Agency can help your company choose the ideal sports personality for your next marketing campaign. To hire Hanson Brothers for an appearance, speaking event or endorsement, contact Hanson Brothers 's booking agent for more information.